President Trump’s tariff announcement yesterday was met by retaliation from the Chinese by way of 25% tax on US hog imports, among other goods. The total tariff amount was rather small, only 3 billion dollars worth of US products, vs the 50 billion we are throwing up, but the markets will take it as a longer term shot at demand and we expect heavy selling on the open across the US commodity space. 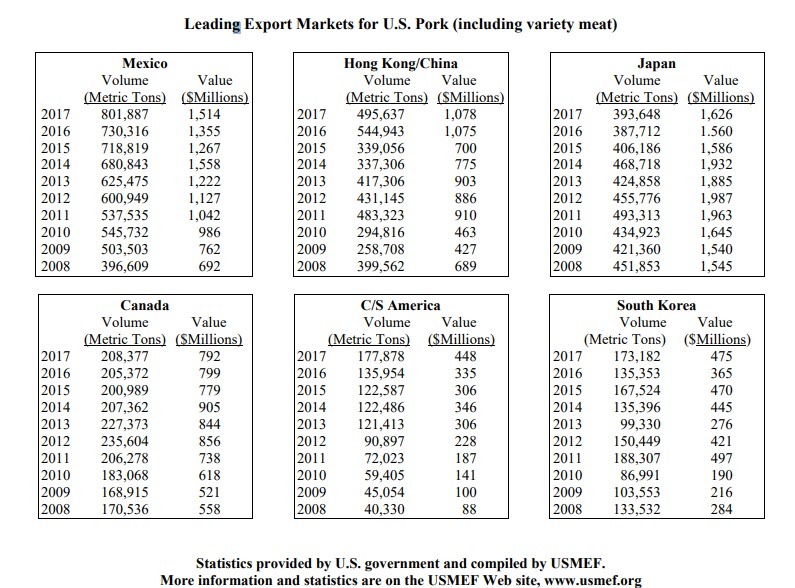 China is the second largest market for US pork. 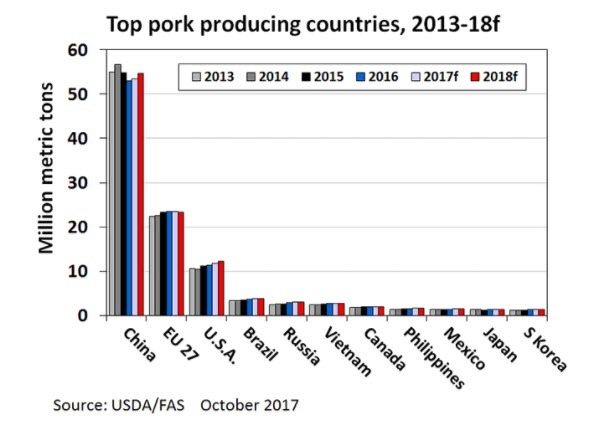 In 2017 the US exported 2.45 MMT of pork around the globe. Of that 2.45 MMT, 500 k went to China only behind Mexico who bought around 800 KMT. I think some of the lost Chinese business can be absorbed, but not all of it. Supply is too high relative to demand and we will see the market adjust, but it will take time and lower prices to shut down production. The industry is no doubt shaking this morning, especially given what could happen if NAFTA falls apart as well (see Mexico). China is the world’s largest consumer of pork. They import from the US and the EU. They are also the world’s largest producer of pork. The winners from this news will be the EU, who will most likely pick up more business, but it is also soybean producers as China will most likely have to step up hog production to make up for this supply and that will take protein. Even as grain and soy prices are lower this morning, this has to have them feeling pretty good. I expect prices to open limit down, probably across the curve. I think in the longer run, we have priced in much of this news, given the recent sell off of 15 dollars from high to low, but the back of the curve remains heavily elevated relative to the front and we could our bull spreads work as prices fall. Stay tuned for position adjustments today. I wish we would have not covered our April shorts yesterday, but this is a process oriented program and covering risk ahead of uncertain events will save us some day as well. We will check in later today.